In 2002, Bobcat Co. introduced its first utility vehicle, the 2100. The following year, the company added a 2100S model with seating for up to four passengers. In 2004, the first Bobcat 4×4 utility vehicle, the 2200, made its debut. A significant introduction occurred in 2006 with the 2300, the first Bobcat utility vehicle that could operate front-mounted attachments with the RapidLink attachment mounting system. Today, the company offers four utility vehicles (in different configurations), including two hydrostatic models. All four utility vehicles provide ample horsepower and speed, allowing for increased jobsite productivity. The gas-powered 3400 and 3400XL feature a 40-hp engine, while the diesel-powered 3400, 3400XL, 3600 and 3650 have a 24-hp engine. 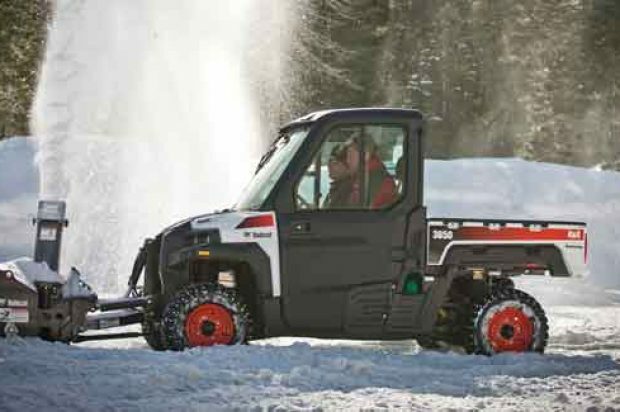 Bobcat utility vehicles offer a top speed of 35 mph; however, the 3400 and 3600 can travel up to 40 mph when combined with an optional speed kit. Each machine features low- or high-range speeds for towing heavy loads or moving light loads at faster speeds. Improved suspension and four-wheel disc brakes give Bobcat utility vehicles industry-leading payload and towing capacity, says Bobcat. UTV operators can haul up to 1,250 lbs of material in the composite cargo box, which is more durable and stronger than metallic boxes, says Bobcat. Continuous variable transmission (CVT) and true four-wheel drive deliver quick machine acceleration and peak performance even when moving heavy loads. Hydrostatic drive systems, available on the 3600 and 3650, allow for better machine longevity, less maintenance and easier operation. An independent front dual A-arm suspension, with rear de Dion suspension, is found on all models for improved ride comfort and stability when towing and hauling heavy loads. The front suspension allows for 6 in. of motion, while the rear allows for 9 in. of articulation in the shocks/springs. The suspension can be adjusted to suit the specific application and jobsite condition. Three drive mode selection options — turf mode, two-wheel drive and four-wheel drive — are available to match varying ground conditions. In turf mode, each wheel spins independently, allowing for minimal ground disturbance on turf, pavement and other hard-packed surfaces. Two-wheel drive allows both rear wheels to receive equal torque and spin for added traction on gravel roads, soggy trails and soft pasture. 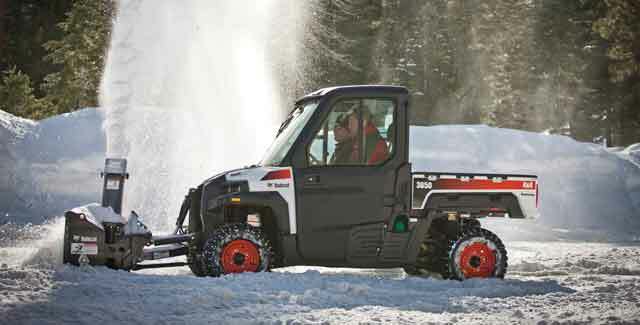 Four-wheel drive allows the machine to easily navigate in shallow streams, travel in snow-covered paths and pull trailers. Specific to the 3650 is the Multi-Attachment X-Change (M.A.X.) system, which allows operators to use approved front-mounted, power take-off (PTO-driven) attachments, including an angle broom, mower and snow blower. The 3650 and M.A.X. system have a lift height of 2 ft and a lift capacity of 500 lbs. Non-PTO attachments — bucket, grapple, landplane, pallet fork and snow blade — increase versatility. A sprayer attachment is available for mounting in the cargo box of all four Bobcat UTVs, while a spreader attachment is available for model year 15 3400, 3600 and 3650 utility vehicles.